The 65' strip-planked Bounty Hunter after sheathing with fiberglass and WEST SYSTEM epoxy. After 5 years, she still looks as good as she did then. In addition, her new skin quickly paid for itself though increased performance. Five years ago, Captain Glenn James decided it was time to make improvements to his Coast Guard-inspected charter fishing boat operating out of Edgewater and Solomon's Island on the Chesapeake Bay. Bounty Hunter is a 65' cedar-strip planked hull, a one-off Davis hull built in 1967 at Harkers Island, North Carolina. The planks are fastened to frames on 16" centers with monel fasteners. The cedar strips are narrow, less than 2" wide, and are edge nailed with monel nails and edge glued. An experienced and successful night charterer, Captain James knew his wooden vessel well but found the upkeep and maintenance had increased over the years, taking more time away from fishing and family. He was ready to minimize the maintenance and hoped to increase performance at the same time. Having used WEST SYSTEM® epoxy for other jobs, he turned to the technical staff at Gougeon Brothers for advice and assistance. While Gougeon Brothers does not typically visit vessels, J.R. Watson was attending a surveyor conference in Annapolis and agreed to look at Bounty Hunter. 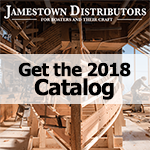 Any wooden boat repair has to be looked at holistically and take into account the owner's requirements and the vessel's construction, condition, and service. (See the WEST SYSTEM 002-970 Wooden Boat Restoration & Repair Manual for a fuller discussion of this and of techniques described in this article.) In this case, Coast Guard inspection requirements also had to be taken into consideration. Captain James and his son, Glenn, Jr., decided to restore Bounty Hunter by sheathing the hull with epoxy and fiberglass. They not only added many more years to Bounty Hunter's life, but the the dryer and lighter hull decreased her draft by 6", increased her top speed from 15 knots to 22 knots, increased fuel efficiency, and gave a smoother ride for paying passengers. After the traditional carvel-planked wooden vessel, El Toro II, sank in the Chesapeake Bay in 1993, taking the lives of one crew member and two passengers, the Coast Guard developed new policy, the Navigation and Vessel Inspection Circular (NVIC) 7-95. This policy required owners of all Coast Guard-inspected wooden vessels, regardless of construction, to pull a sampling of planking fasteners at regular intervals during credit dry dock or when other indications provided the necessity to do so. An investigation found that degraded fasteners on the El Toro II caused a few planks to come loose and fail when she encountered heavy seas. Examination of other planks after the vessel was recovered showed that while many of the fasteners looked good on the surface, half of them throughout the vessel were wasted within the plank-to-frame joints to the point of providing no structural integrity. Captain James wanted to explore avenues to minimize or eliminate the required pulling of fasteners, which in some instances could cause more damage than good, on Bounty Hunter. Unlike El Toro II, Bounty Hunter was originally glued and nailed together in a monocoque, cedar-strip construction, so the skin acts as one complete shell. Vessels constructed like this are ideal candidates for sheathing with fiberglass and epoxy because they require considerably less preparation. Once a vessel is sheathed, she will be considered a "composite" hull, one made of different materials, and consequently be subject to less stringent and invasive inspection standards than a traditional wooden vessel. Captain James was required to seek Coast Guard permission prior to modifying the vessel. Here is the process that WEST SYSTEM recommended. The Coast Guard approved the plan and monitored each step carefully throughout the project. Sheathing Bounty Hunter proved to be an excellent decision, and the project was completed without reservation by any of the parties. Preparation is a common thread in any project. Sheathing a wooden hull with fiberglass is no different. Sheathing is only recommended for vessels that have planks that are edge glued together and are securely attached to the frames.The following steps were taken to ensure Bounty Hunter was structurally sound prior to sheathing. All paint and loose material were removed from the exterior of hull. The vessel was thoroughly inspected for damaged or deteriorated hull planks, seams, and fasteners. Any degraded items were removed and replaced in kind. Wood replacement adhered to applicable Coast Guard regulations and policies, such as NVIC 7-95. At least an 8:1 scarf is normally recommended for scarfing new planks into place, but longer scarfs are always a good option to maximize the bonded surface area. Any deteriorated seams were cleaned and old material removed. Mixed epoxy, thickened with 403 Microfibers to a peanut butter consistency, was forced into the seams to bond the planks back together as needed. Monel fasteners similar to the original ones were used to refasten planks. High spots on the hull were taken down because the fairer the original hull is prior to sheathing, the easier the final hull will be to fair later. The moisture content of the vessel was checked prior to sheathing to ensure that it was between 8%-12%. Remember to use a moisture meter recommended for the specific application (wood, fresh water service, salt water service, etc. ); otherwise erroneous readings may be obtained. WEST SYSTEM 105 Resin was used with 206 Slow Hardener, combined at the proper mixing ratio, 5 parts 105 Resin to 1 part 206 Hardener by weight or volume. To make volumetric measuring easier, a cylindrical mixing pot with straight, vertical sides and a metering stick with pre-measured marks were used. Quality control was in keeping with WEST SYSTEM 000-742 Quality Assurance Considerations. Quality control dyes yellow to the resin, blue to the hardener were added at the factory. When a consistent green color was obtained, the two parts were properly mixed and ready to be applied. The fiberglass cloth was two layers of 7.5 oz biaxial (+/- 45 degrees) cloth stitched to .8 oz chopped strand mat. The orientation of the fiberglass (vertical or horizontal) was insignificant; in this case, it was applied vertically. Edges and seams were staggered at least 3" to gain full advantage of the fiberglass strength. Applying the cloth was tiring and required 3 "animals" with stamina and strength. The two layers were completely applied in just four days. Work was done for about two hours on one layer and, once this was tacky, a second layer was applied on the tacky first layer to promote a primary chemical bond between the two layers. Once applied, the cloth was worked hard to remove any entrapped air since air pockets in a laminate can reduce its strength dramatically. A resin-to-fiber ratio of 50:50 by weight produces optimum physical properties for a hand-laid laminate. However, a higher percentage of mixed resin is acceptable and not uncommon. A resin-starved laminate can weaken the structure. The first layer was applied so that the resin-rich chopped strand mat was next to the prepped hull to improve adhesion. Even though the Bounty Hunter was painted white, the second layer was applied with the mat outside to help prevent print-through. A layer of epoxy/407 Low-Density fairing compound was applied to the fiberglass surface and faired later. Up to a 1-1/4" of fairing compound was applied to create fairness throughout the length of the 65' vessel. The fairing layer also helped to disguise print-through and minimize its effects. Bounty Hunter was sanded to remove high areas and then faired. The fairing compound consisted of WEST SYSTEM 407 Low-Density Filler and the same 105/206 epoxy used in the laminate, mixed to peanut butter consistency (approximately 12 oz of filler to 1 qt of mixed epoxy). Once the hull was sanded fair, two coats of Awlgrip High Build Primer were applied, followed by one coat of regular primer. Bounty Hunter was finished off with one coat of Awlgrip paint. After 5 years of service, the hull is clean and shows no sign of degradation. It has held up to the extreme environment charter vessels face and has given Captain James a hull with minimal maintenance. Awlgrip and other two-part polyurethane finishes, although not inexpensive, are among the toughest on the market and have proven themselves in all types of adverse conditions. Continued maintenance ensures the longevity of a wooden boat restoration project. Deterioration in the final painting system needs to be addressed as soon as practical to limit exposure to ultraviolet rays of the sun. Dings and cracks to the hull also need to be quickly addressed to maintain the moisture barrier and protection that the new sheathing provides to the composite skin. Captain James evaluated the ventilation in Bounty Hunter and determined that plenty of air was being changed throughout the vessel, including the bilges and other voids. Keeping the boat's interior as dry as possible is the best preventive maintenance for preserving the structure. Bounty Hunter was sheathed 5 years ago and still looks as good as she did then. In addition, her performance characteristics increased, so the new skin paid for itself quickly. Because of success of Bounty Hunter's restoration, Glenn James, Jr. has taken on five similar projects since then. The successful sheathing of Bounty Hunter with fiberglass and WEST SYSTEM epoxy gave Captain James and the Coast Guard confidence to turn a wooden boat into a lower maintenance composite hull. Now, with less time spent to maintain wooden boats, there's more time to enjoy the fishing. Patrick Ropp was a Gougeon Brothers Technical Advisor until 2001 when he returned to active duty as Lieutenant Commander in the Coast Guard. He is also pursuing an engineering degree at Michigan State University.